add logical, should the 2D barplot be added to an existing plot> Defaults to TRUE col.frame the colour of the frame of the 2D barplot lwd.frame the line width of the frame of the 2D barplot... On 20.03.2011 18:52, Hongwei Dong wrote: Hi, R users, I there a way that I can control the position of the legend while using "barplot" function? A numeric vector (or matrix, when beside = TRUE), say mp, giving the coordinates of all the bar midpoints drawn, useful for adding to the graph. If beside is true, use apply(mp, 2, mean) for the midpoints of each group of bars, see example.... Here, we’ll describe how to create bar plots in R. The function barplot() can be used to create a bar plot with vertical or horizontal bars. In R you can add a legend to any plot using the legend() command. You can also use the legend = TRUE parameter in the barplot() command. The barplot() command is the only general plot type that has a legend parameter (the others need a separate legend).... Thanks, this could work! However, the legend does not reproduce the color/shading used in the original barplot, are those available somehow? 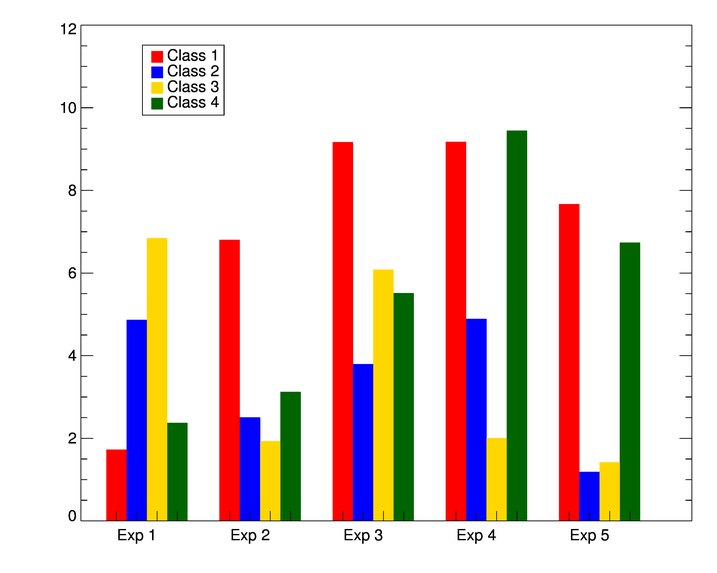 into a group, you should use grouped barplot. If you want to study the evolution of subgroups, do a stacked barplot. However, note that faceting can be a good alternative. If you want to study the evolution of subgroups, do a stacked barplot. A numeric vector (or matrix, when beside = TRUE), say mp, giving the coordinates of all the bar midpoints drawn, useful for adding to the graph. If beside is true, use apply(mp, 2, mean) for the midpoints of each group of bars, see example. Stacked barplot and grouped barplot are almost the same thing. Using R , you just have to add beside=T to go from one to the other. You can easily add a legend with the ‘legend’ option. If you add a legend to a plot, it will be placed inside the plotting area by default. The following example creates a stacked bar plot with the sales data of books, magazines and newspapers. In such type of plots you will normally use a legend to describe the data. Marc Schwartz Dan, Do not edit the barplot() code. Use the legend() function instead, which enables you to specify the x,y coordinates of the upper left hand corner of the legend box.